Never backward about coming forward when asked for my opinion, it usually doesn’t take me long to share whatever it is that’s being asked of me. Occasionally though, very occasionally, I need time to think of an answer. It’s not that one doesn’t immediately come to mind but more that I discount the first half a dozen answers before settling as if I can hear the quizmaster asking: Is that your final answer? When asked the title of the best book I had read in 2014, I had to stop and think. I’ve read a number that have been excellent. My mind felt a little like a lottery-ball shaker – some suggestions almost made it out of the chute but weren’t quite close enough; not quite good enough to top the Best of 2014 list. I eventually decided. 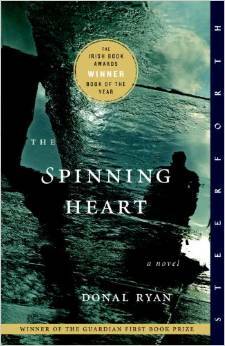 Donal Ryan’s debut novel The Spinning Heart. Set in modern-day Ireland, its 21 narrators (ergo 21 chapters) tell their stories of pain, loss, misery, grief with the occasional flash of humour and large dollops of wit. A fine thread weaves between them, one that is just about strong enough to get us to where we are going without feeling we’ve read a series of short stories or essays. Daphne Kalotay, reviewing the book for the New York Times was a tad concerned as to how she’d deal with such an extensive cast of characters. I shared that concern till five characters in when I realised how skillfully they all knit together. Facebook and dubious deals in Dubai, ghost estates and drinking the family farm pay homage to Ireland as she is today. The spoken word jumps off the page as the characters come to life – they could be your neighbours. And that’s the beauty of it. Anyone who has lived in Ireland (especially in the last 15 years) will be able to identify with the cast of 21. It took best book of the year at the Irish Book Awards and the Guardian’s Best First Book prize. I haven’t read the other books that were shortlisted for those competitions but this one is the best debut novel I’ve read since Jon McGregor’s If nobody speaks of remarkable things. And like McGregor, Ryan is someone I’ll be keeping track of. To follow this one will be quite the challenge. Treat yourself. It’s a bargain at twice the price.